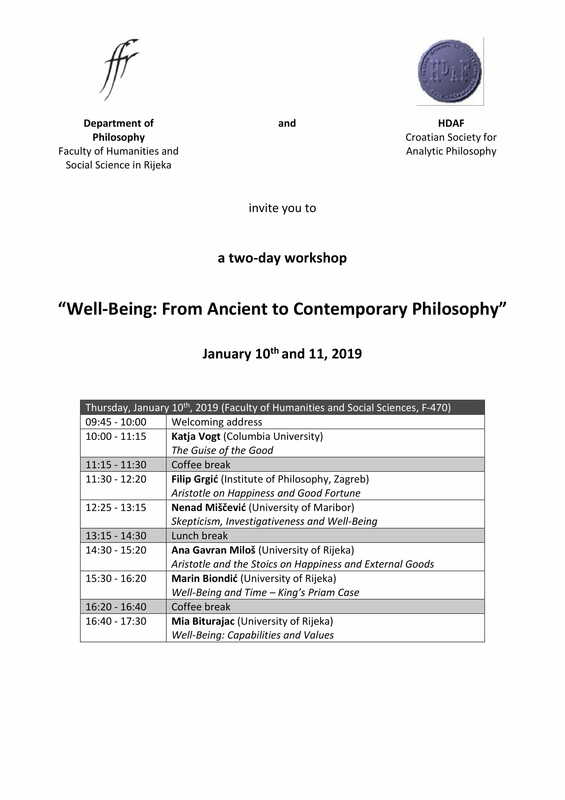 We invite you to the workshop Well-being: From Ancient to Contemporary Philosophy, the secondevent organised within the project Well-being, Affiliation and Social Justice. The workshop will be held on January 10th and 11th, 2019, at the Faculty of Humanities and Social Sciences (F-470). Confirmed participants are: Katja Vogt (Columbia University), Elena Irrera (University of Bologna), Nebojša Zelič (University of Rijeka), Ana Gavran Miloš (Universty of Rijeka), Elvio Baccarini (University of Rijeka), Filip Grgić (University of Zagreb), Nenad Miščević (University of Maribor), Marin Biondić (University of Rijeka), Ivan Cerovac (University of Rijeka) and Mia Biturajac (University of Zagreb). Funded by the Croatian Science Foundation. Grant: UIP-2017-05-3462.